Isthier Chaudhury graduated from the University of Rochester in 2011 as a double major in mechanical engineering and Chinese studies and spent the 2009-10 school year at Beijing University. Jaila Cramer got her first taste of China in June 2011 before her senior year at Oregon State University. Although she was only abroad for a month, being exposed to the culture, language and curriculum at Dongbei University whetted her appetite to continue her education overseas. Now, the Portland native is back in China pursuing her master’s degree in business and international economics at Nankai University in Tianjin. Since the 2009-10 school year, China has become the top country for sending students to study at American colleges and universities. Approximately 25 percent of the 760,000 international students studying at American colleges and universities are from China. That number has grown since the 2011-12 school year when Chinese students made up 23 percent of the 194,000 international students here in the States, according to the Institute of International Education, a New York-based international education and training organization. China’s decision to encourage its students to study in the United States is a stupendous jump since the country prevented students from doing so during the second half of the 20th century. These days, Chinese society values American university degrees since students receive a foundation in the liberal arts and are taught how to think creatively as opposed to the more rigid curriculum Chinese students receive at home. But there’s a reverse phenomenon going on—more Americans are heading to China to supplement or complete their undergraduate and/or graduate education. According to an Open Doors Report released earlier this year, which is published by the Institute of International Education in conjunction with the U.S. State Department, the number of American students studying in China rose from 3,291 in 2000 to more than 15,000 in the 2010-11 school year. That number is expected to rise rapidly in the coming years. The growing interest to study in China is driven by several factors, including China’s status as one of the world’s three leading economic and political powerhouses, and the Chinese government’s aim to improve its image, particularly in the United States, where the country is viewed in some corners as a rival or a mystery. If more of America’s young, future leaders spent time in China, the government reasons, it would help to improve relations between the two nations. Perhaps the biggest catalyst of Americans’ growing interest in China is the 100,000 Strong Initiative, which was introduced in late 2009 by the Obama administration to increase the number of high school and college students studying in China. The initiative to send 100,000 American students to China is designed to address the nation’s knowledge deficit, since Chinese students are coming to the United States and learning about their top economic and political rival. Blumenthal says more American colleges, universities and high schools are teaching about China. She adds that the Chinese government has been aggressive about enticing American students to attend college in its country. According to Blumenthal, Chinese officials have made it easy for Americans to study at universities there since some use English as the language of instruction. Cramer says having all her classes in English made it more attractive for her to study in China. IIE data show that more students are receiving their graduate degrees from Chinese universities. IIE officials estimate that more than 2,000 students are getting graduate degrees in China. For many of these students, the motives are purely pragmatic and bode well for relations between the two countries. “We need more people who can speak [the Chinese] language and can make informed decisions about issues that impact the two countries,” says Victoria Winslow, a 2012 international studies graduate of Spelman, who speaks fluent Mandarin and studied at Fudan University in China in fall 2011. Cramer says marketability and the harsh hiring climate inspired her decision to get her master’s at a Chinese university. “Not everybody is going to get a job [here] when they graduate,” she says. 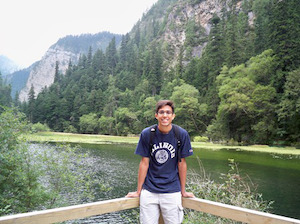 Many students say studying in China broadens their horizons, culturally and professionally. Isthier Chaudhury, who graduated from the University of Rochester in 2011 as a double major in mechanical engineering and Chinese studies and spent the 2009-10 school year at Beijing University, says understanding the nuances of the culture—and observing them—can be a huge contributor to student success. Blumenthal says it takes work to make the most out of the opportunity to study in China.